Join us for a relaxing afternoon perusing the studios and works of our artists, artisans, and new media professionals at our 10th Annual YoHo Artists Open Studio Weekend. Open Studio this year is Saturday & Sunday, April 20th and 21st, 2013, from 12 noon to 5pm... At 578 Nepperhan Avenue; Yonkers, NY 10701. YoHo Open Studio is an annual favorite on the calendar for art enthusiasts, arts professionals, and the curious public. This is a unique opportunity to visit artists, artisans and new media professionals in their studios and see the works they are currently producing. 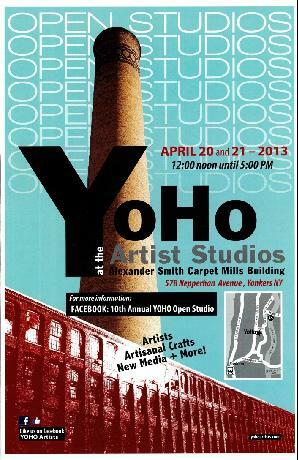 YoHo Open Studio weekend is one of the largest of its kind in the greater NYC metropolitan region. It is most certainly one of the most convenient venues for Open Studio with major road access, reasonable parking, and building elevators in a single grouping of buildings... all at the footstep of New York City. YoHo Open Studio weekend is a FREE event. Refreshments, Live Music, and great networking in the Arts will all be available. Visit our YoHo Artists facebook fan page for more information. 'Like' us to follow updates on this event and many other events involving the resident artists of YoHo. See you at our Open Studios!